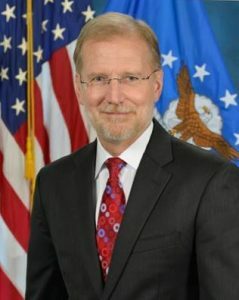 Steven D. Wert, a member of the Senior Executive Service, is Program Executive Officer for Battle Management, Air Force Life Cycle Management Center, Hanscom Air Force Base, Mass. He leads more than 3,500 Airmen, government civilians and support contractors in the acquisition execution of a $19 billion FYDP portfolio of ACAT, non-ACAT, technology transition, and Foreign Military Sales programs. He reports directly to the Service Acquisition Executive and is the milestone decision authority for delegated ACAT-II and all ACAT-III programs in the Battle Management portfolio.Mr. Wert served as an Air Force officer for nearly 25 years. He led performance engineering on the advanced medium-range air-to-air missile, and served as program manager for missile integration efforts with the NATO Eurofighter, JAS-39 Gripen and Peace Onyx F-16 programs. He later directed the Airborne Warning and Control System Radar Development Team and led the ACAT-I U.S./NATO Radar System Improvement Program.Mr. Wert was on the Air Force Program Executive Officer staff as Director for Surveillance and Control Programs, including the E-3, E-4 and Peace Shield. He subsequently served as Deputy Director for Congressional and Budget Integration, Information Dominance, in the Office of the Assistant Secretary of the Air Force for Acquisition. He was previously assigned to the ESC as executive officer to the commander, and led the Air Force Distributed Common Ground System Program before joining Headquarters Air Force Materiel Command as Deputy Director for Engineering. Following active duty, Mr. Wert was employed by SRA International, Inc., supporting the Office of the Air Force Deputy Chief of Staff for ISR. Prior to his current appointment, he was Program Executive Officer for Theater Command and Control, Electronic Systems Center, Hanscom AFB, Mass.